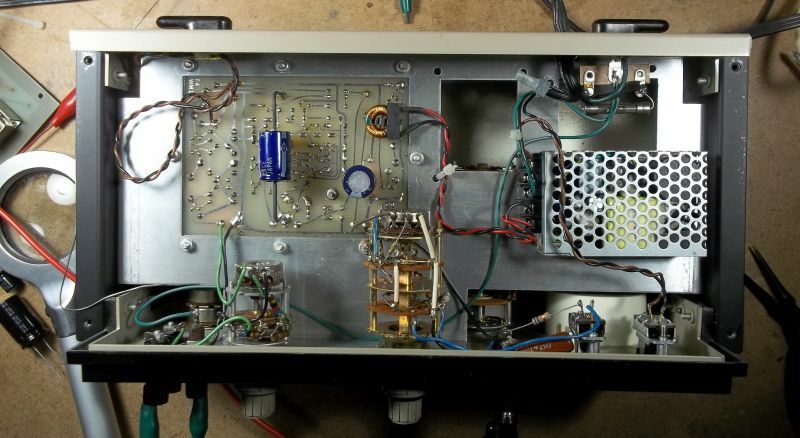 The Heathkit IG-18 was the first new piece of test equipment I ever owned. I think I bought mine in late 1976 or 1977 when I was just a kid. There has been a lot written about the IG-18 and the later IG-5218 over the years about distortion reduction. With the Morrey mods I've found the limiting factor to be the variable level pot. Wide open I get somewhere around 0.0009% THD. Lowering it raises the distortion to the 0.0038% range. The issue is not hum and ripple on the DC: It's the transformer's hum field. 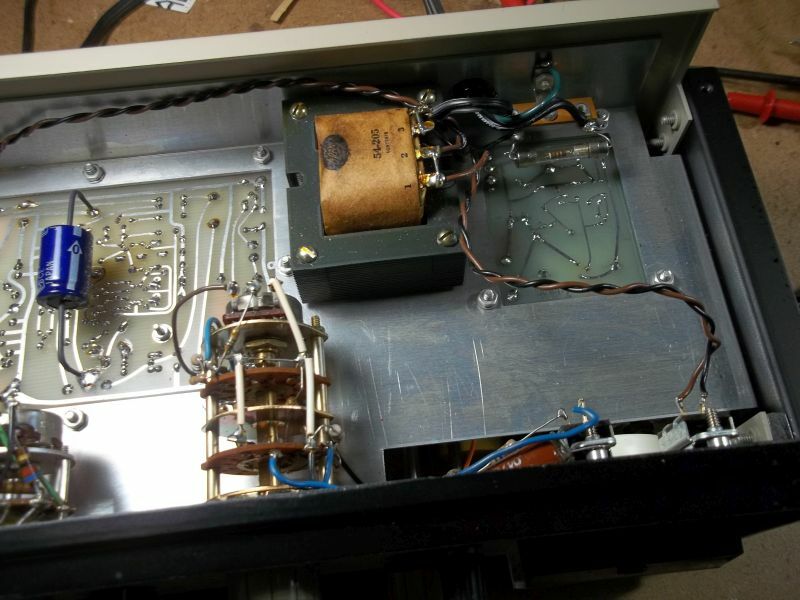 When I opened the IG-18's case recently to clean it I recalled the close proximity of the power transformer to the oscillator tuning caps and output attenuator. 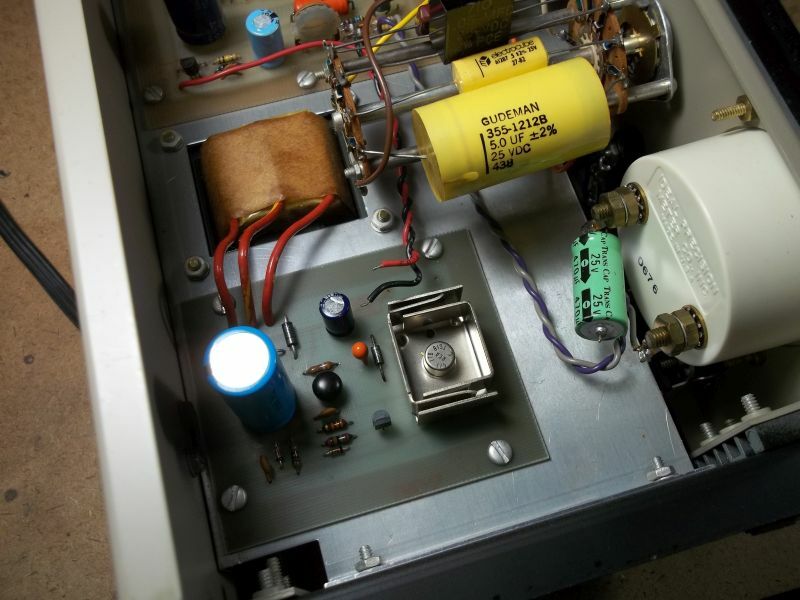 The close proximity of the neon pilot lamp leads to the variable tuning resistor also raised eyebrows. I decided to power the IG-18 from a linear bench supply. Wow. The improvement was real. 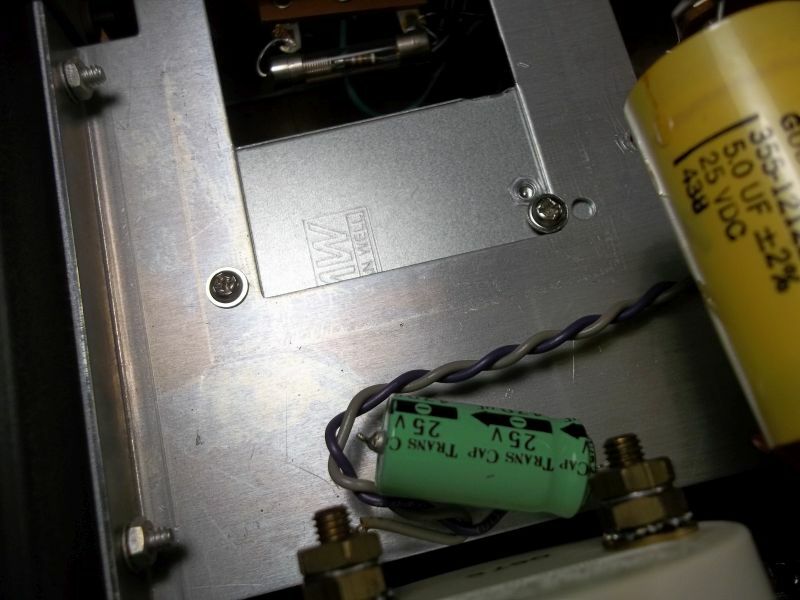 When the IG-18 is powered from a bench supply and the internal supply is turned on, but not connected, it gets bad. Really bad. I decided to power the IG-18 from a 48V switcher. I wasn't sure I'd be happy with it so I didn't want to drill holes and carefully removed the power supply and regulator PC board in case I needed to reinstall them. The switcher mounts under the IG-18's "deck" plate. 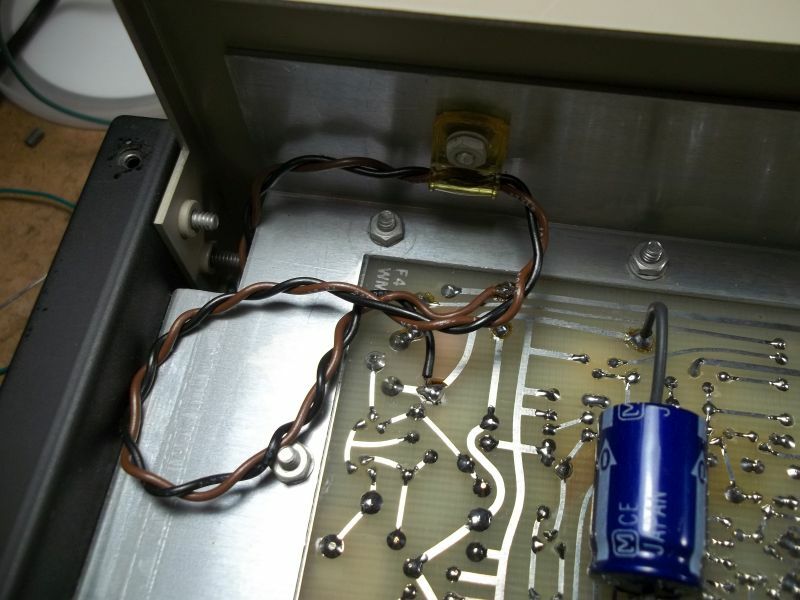 The switcher is held in place by one of the mounting holes and the corner of the cutout with TS3x6 mm screws. Use short length screws if you try this at home. The Meanwell is pretty noisy despite the greatly-improved FFT compared to the original linear supply. 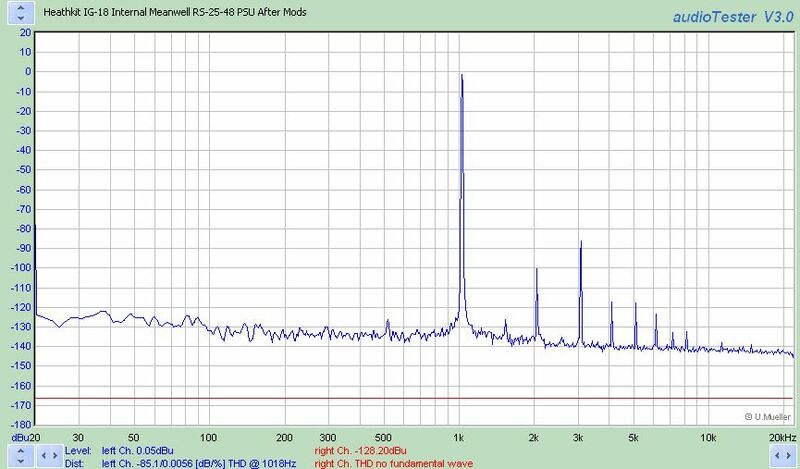 I could see HF hash in the IG-18 attenuated output. A simple common mode choke, 3.9 mH, on the output greatly reduces conducted noise to the point it's usable. 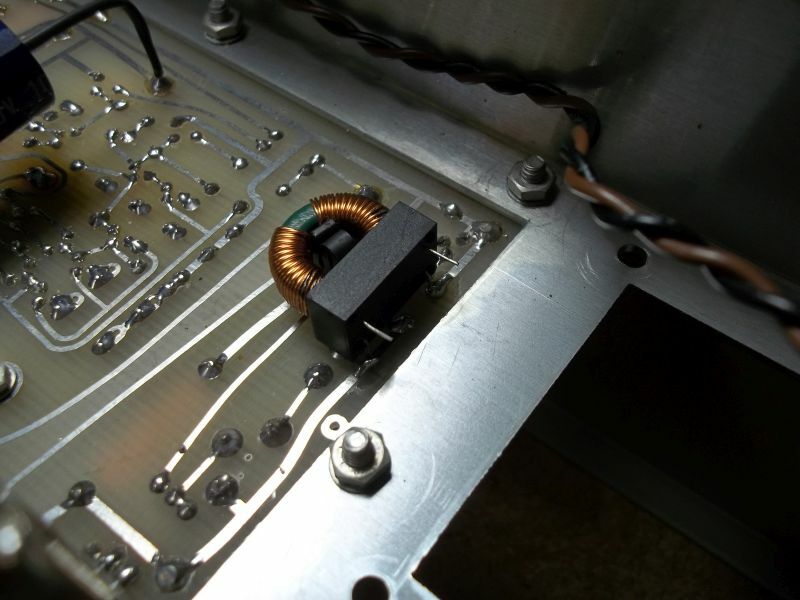 Once the switcher was installed in the chassis there were still some 60 Hz spurs and high harmonics. Disconnecting the neon pilot lamp eliminated them. The neon was removed and replaced by a red LED. 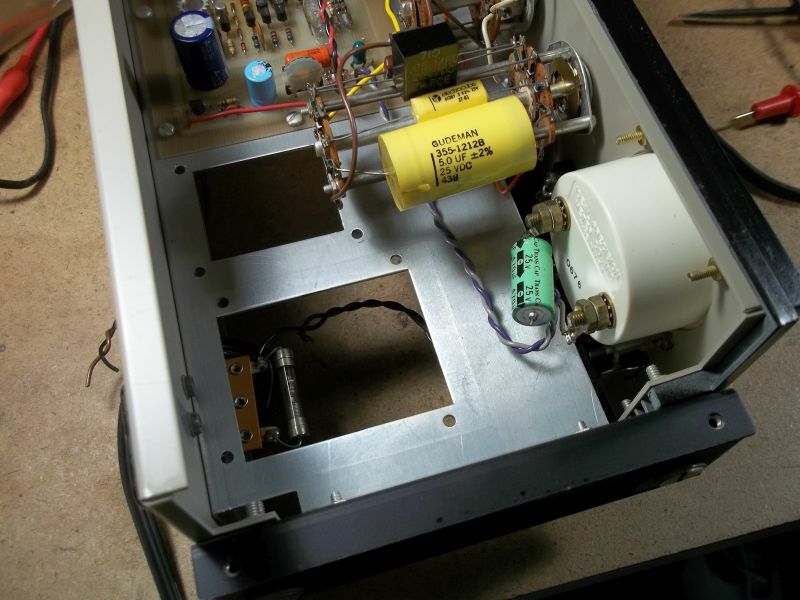 The original 27K limiting resistor was re-used. 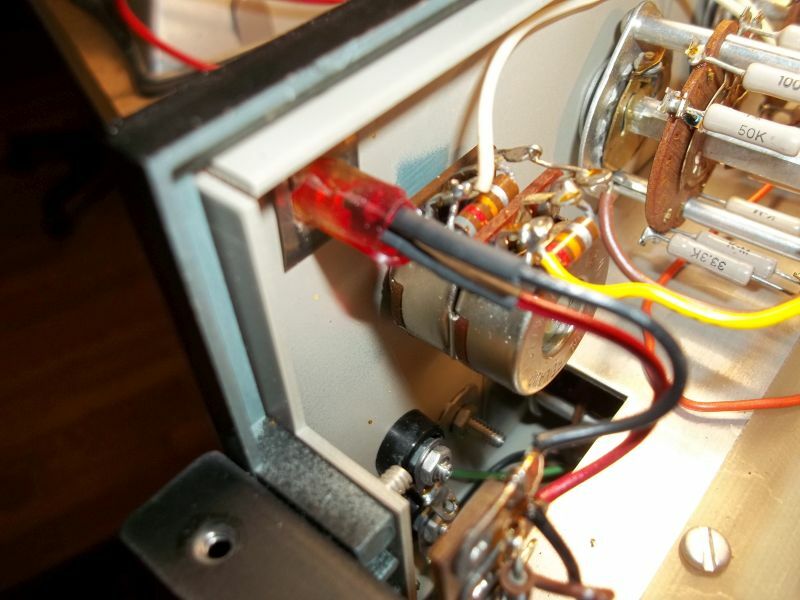 The LED wiring is moved to the "+48V" bus and ground. 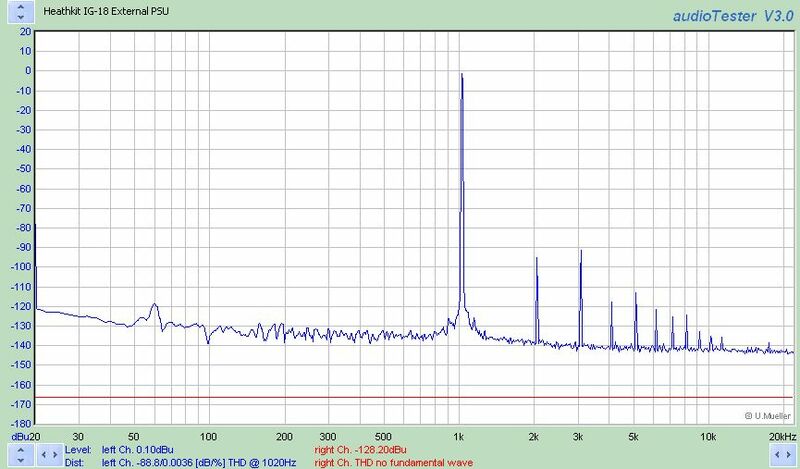 There was still a small amount of 1 kHz and 500 Hz leakage from what I think is the switcher's spread-spectrum modulation frequency. The Morrey IG-18 board has no bulk capacitance on the PC board. 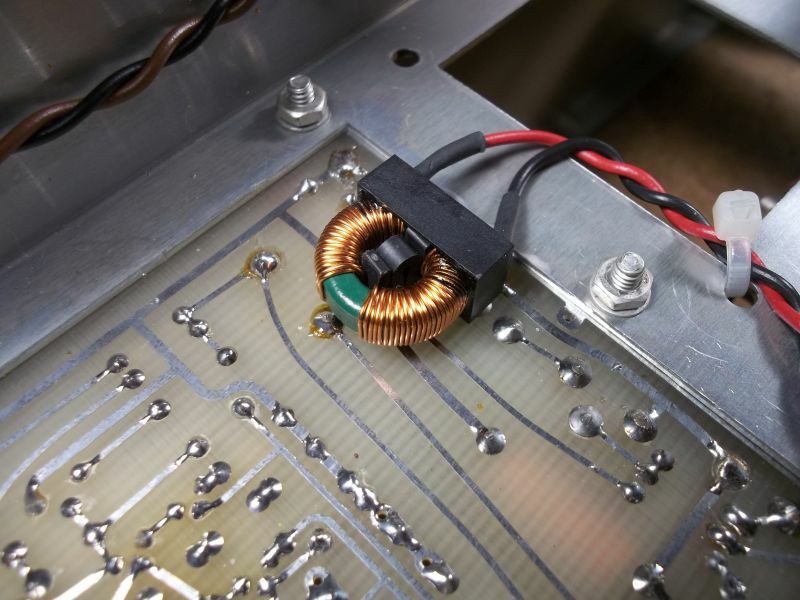 A 1000 µF/50V cap was added greatly reducing noise and virtually eliminating the last of the 500 Hz spur. 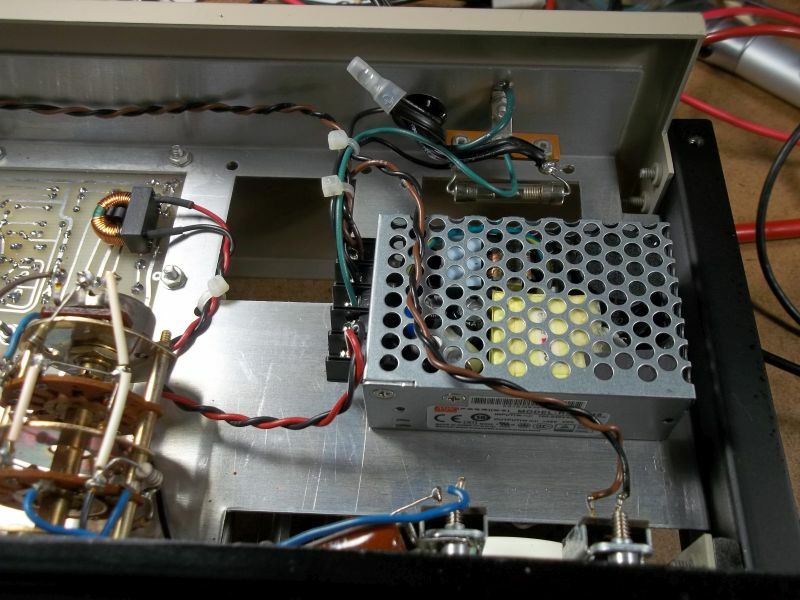 The power supply is adjusted down to 45V using its trimmer. 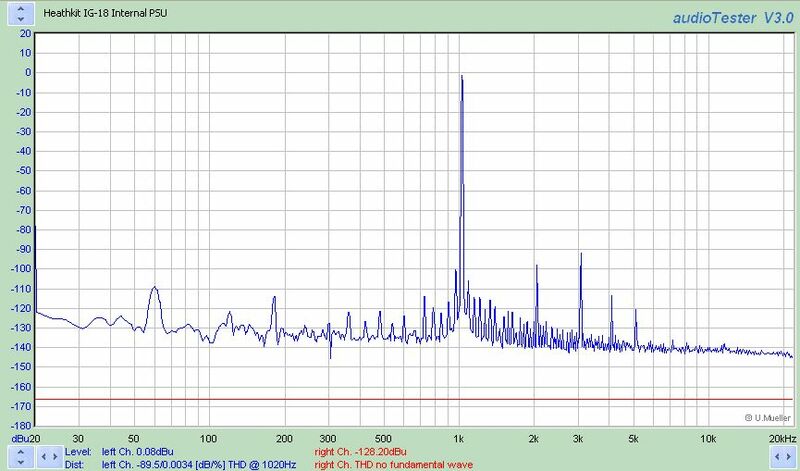 I'd be tempted to ignore hum down 100 dB but a good quality narrow bandpass filter built using modern op amps could knock down the distortion products a couple ten dB? I added copy this morning. I figured if I had written it when I posted the pics it would have been even less coherent. It could definitely benefit from having lots more open loop gain. Before the Morrey mod it had even less. I'm tempted to re-spin that board with a "super" or composite op amp and industrial-strength buffer. The output pot is the limiting factor at the moment. The wide-open 0.0009% figure is tied with one of my DACs so a good portion of that may be the A/D converter used to measure. 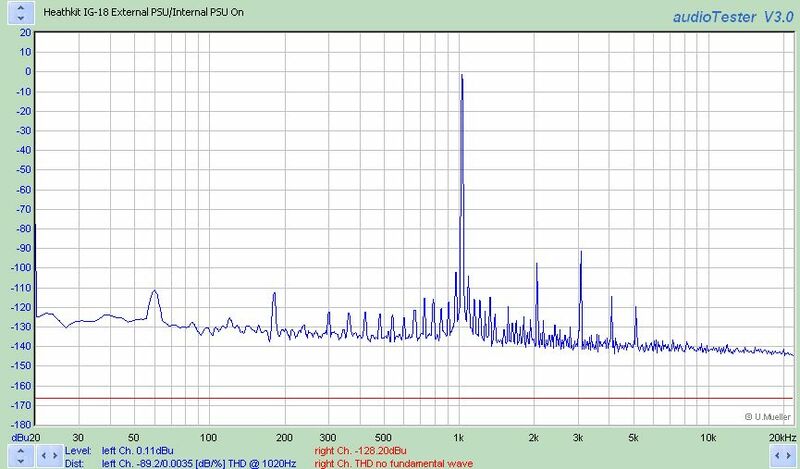 The main reason for knocking down the hum is sidebands and the hum signature providing an excuse for ill-informed "experts" at other fora to piss all over something the IG-18 is used to stimulate. I'm really enjoying not having to "jiggle" the attenuator when I go to make a routine measurement.